Spend the day on the beautiful new SantaMaria trimaran, sipping cocktails in the warm Puerto Vallarta sunshine. You'll enjoy a continental breakfast as you pass by the skyline of Puerto Vallarta, making for some wonderful photos, on your way to Los Arcos marine park, where you'll enjoy some of the best snorkeling in Puerto Vallarta. Then it's on to Las Animas, perhaps the best beach in all of Vallarta. You can relax in the sunshine, swim, have a drink at one of the beach bars, or enjoy beach activities such as kayaking or banana boat rides. The last stop is the small fishing village of Quimixto. Here you'll enjoy a fully cooked lunch on the beach - your choice of fish, chicken, or quesadillas. 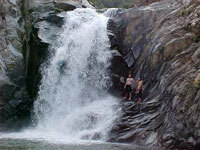 After lunch, you can walk or rent a horse and ride to a beautiful waterfall or enjoy your time on the beach. Then it's back on the boat to continue to enjoy the non-stop drinks from the open bar on board and listen or dance to the beat of the music. Not Included: Entry fee to the marina (15 pesos - about $1.50 USD), Drinks on the beach, Beach Activities such as horseback riding, jet skis, parasailing, and banana boat rides.